Two Tiger fumbles in the fourth quarter gave Wabash the only opportunity they needed in the Little Giants’ 22-21 win over DePauw during the 124th Monon Game on Saturday. DePauw took a 21-14 lead into the fourth quarter before things took a turn for the worse. The Little Giants recovered junior Andy Hunt’s fumble on a punt return at DePauw’s five-yard line. Wabash running back Ike James powered through for a touchdown on the very next play. Little Giants quarterback Weston Murphy found wide receiver Kirby Cox in the end zone on a two-point conversion to put the Little Giants ahead for good. 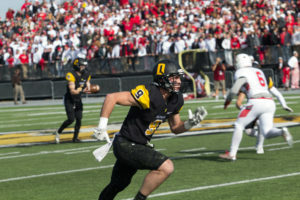 When Tigers senior quarterback went down with an injury the following drive, senior wide receiver and former quarterback Nolan Ayers gave DePauw hope on the following drive when he converted a 3rd down conversion with a 17-yard pass to senior wide receiver Jake Hagan. The Tigers managed to get within Wabash’s 10-yard line before Little Giants’ Ryan Walters knocked the ball from Ayers as he attempted to run it into the end zone. The Little Giants recovered the fumble for a touchback, and the Tigers never recovered.